Secretary of Education Betsy DeVos is committed to addressing school safety, she just doesn’t want to talk about the very specific and unique-to-the-United States problem that makes schools unsafe, per se. 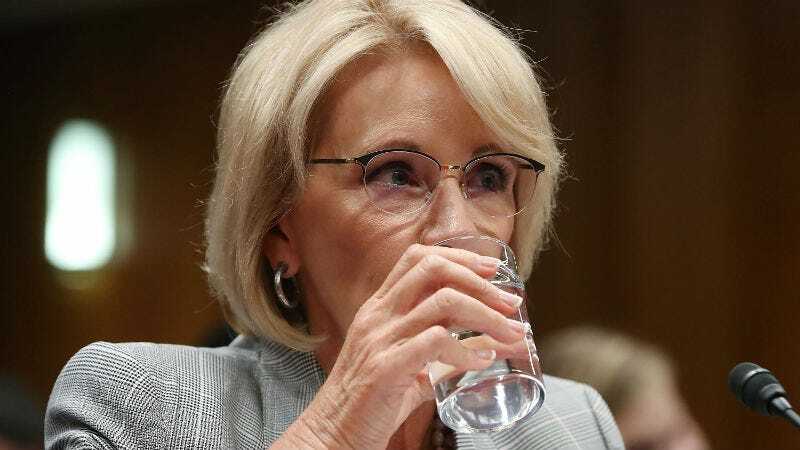 At a Senate subcommittee hearing regarding education spending, Democratic Senator Patrick Leahy of Vermont asked DeVos if her school safety commission will look into the roll that firearms play in school violence. The commission, as it happens, was formed in the wake of the Parkland massacre, in which a gunman with a military-style assault rifle killed 17 people at Marjory Stoneman Douglas High School. Leahy then asked if the commission is looking into why countries in which students have just as much access to violent video games and social media as students in the United States don’t have school shootings. “Not per se,” said DeVos. “So you are studying gun violence, but not considering the role of guns,” said Leahy. It sure sounds like it, per se!